Bill Cosby has been found guilty on all three counts of aggravated sexual assault. He returned to his Cheltenham Township home on $1 million bail until sentencing. Two days after his conviction, Bill Cosby has already started life as an inmate — though his surroundings are far nicer than they likely will be in a few months. A judge says Cosby will be confined to the same suburban Philadelphia mansion where jurors concluded he drugged and molested a Temple University women's basketball administrator, ordering him to be outfitted with a GPS ankle bracelet to monitor compliance. Until sentencing, Judge Steven O'Neill ruled Friday, the 80-year-old comedian may leave his house only to meet with his lawyers or go to the doctor, and he must get permission first. It was the latest sign that Cosby's past — a sordid double life that gave lie to his carefully cultivated image as America's Dad — had finally caught up with him. 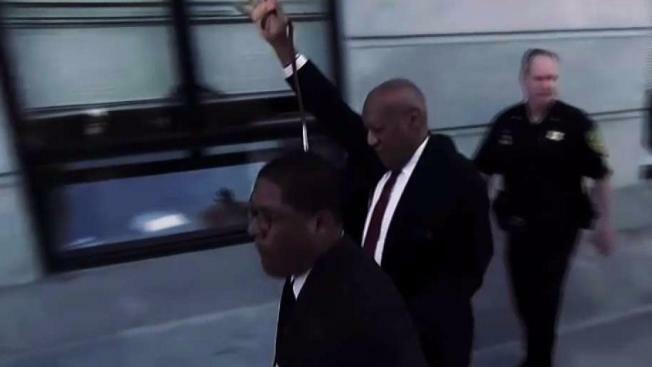 Cosby was convicted Thursday of three counts of aggravated indecent assault and now faces the prospect of spending the rest of his life behind bars. His team blasted the retrial as a "public lynching" and began looking ahead to an appeal. Prosecutors put five other women on the stand to testify that they, too, were abused by the former TV star, but the strategy that helped them secure a conviction could also serve as a template for his lawyers seeking to overturn the jury's verdict. Christopher Adams, a defense attorney whose clients have included former NBA star Jayson Williams, said the judge's decision to allow the "prior bad acts" testimony could have tainted the jury. "It's one thing if they looked at one or two, but five? He wasn't charged with being a serial assaulter," he said. Former federal prosecutor David Axelrod, now in private practice in Philadelphia, agreed that Cosby's team has a shot at convincing an appeals court that the judge went too far. Constand, now 45, first went to police in 2005 with her allegation that Cosby had knocked her out with three blue pills he called "your friends" and then penetrated her with his fingers as she lay immobilized, unable to resist or say no. But the district attorney at the time halted a police investigation after just four weeks, declaring the case too weak to be prosecuted. The current district attorney, Kevin Steele, who made the decision to retry Cosby after last year's hung jury, said in a statement Friday he hoped the case would "pave the road for future victims to come forward to law enforcement and have their allegation investigated." How the jury arrived at its verdict remained a mystery. O'Neill did not immediately make public the names of the seven men and five women, prompting The Associated Press and other news organizations to go to court Friday in a bid to get them released.